Welcome to Believers’ Fellowship, with Bro. 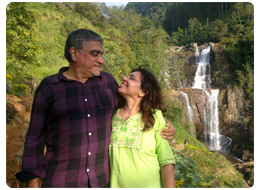 Manu as founder and Teacher, along with his wife Asha. In 1983, Asha and I experienced the life changing power of God that led us to a personal relationship with the Lord Jesus Christ. Since then we have been hungering and thirsting for the truth, understanding that Jesus was not just another religion, but He is Life Himself. Over the years, we’ve been building ourselves on the solid foundation of God’s Word, and continue to share with many others the uncompromised Word of God. This ministry challenges and encourages believers to develop and mature in their walk with the Lord. As the Word of God is spoken with boldness, power and grace, I am assured that deliverances take place in the lives of believers and they are edified, built up and equipped to do the work of the ministry. We live in a day and age where Christians are double minded in what they believe because of ‘winds of doctrine.’ “A double-minded man is unstable in all his ways”. The Word of God declares that, “You shall know the truth and the truth shall make you free.” God’s Word is power in itself, when it is rightly divided and expound by the Holy Spirit, and not by man’s theories or traditional teaching. God is fully in control and He has given us a manual – the Bible - to direct our lives. The time is now to conform to the Word, His plan and His standards. The people of God should be victorious, prosperous and healthy in all the earth, for they are the ambassadors of the Almighty God, Creator of all that exists. This ministry is committed to the fullest of its ability to handle the Word of God with integrity, by the manifestation of the truth, commending ourselves to every man’s conscience in the sight of God. Our aim is to help believers understand the Word and grow up into mature sons of God, not keeping themselves busy with doctrines of demons, but ruling and reigning in this life in one Christ Jesus, right here and now. We are reaching out to the island Sri Lanka and beyond its borders with the Word that brings Faith and changes the lives of the people, bringing hope and healing. Our vision is to spread the message of the Kingdom of God through literature, audio and video. We as a family, together with our two young daughters, Shamma and Shalome, enjoy serving our Lord Jesus Christ, Who has truly blessed us. Believers’ Fellowship is situated in Dehiwala-South, West Province of Sri Lanka, serving the body of Christ in English, Sinhalese and Tamil. We invite you to explore the many facets of this ministry.